The mystery that is the origin of flowering plants has been partially solved thanks to a team of French researchers. Their discovery, published in the journal New Phytologist on February 24, 2017, sheds light on a question that much intrigued Darwin: the appearance of a structure as complex as the flower over the course of evolution. The team was made up of researchers from the Laboratoire de Physiologie Cellulaire et Végétale (CNRS/Inra/CEA/Université Grenoble Alpes), in collaboration with the Reproduction et Développement des Plantes laboratory (CNRS/ENS Lyon/Inra/Université Claude Bernard Lyon 1) and Kew Gardens (UK). Terrestrial flora is today dominated by flowering plants. They provide our food and contribute color to the plant world. But they have not always existed. While plants colonized the land over 400 million years ago, flowering plants appeared only 150 million years ago. They were directly preceded by a group known as the gymnosperms, whose mode of reproduction is more rudimentary and whose modern-day representatives include conifers. 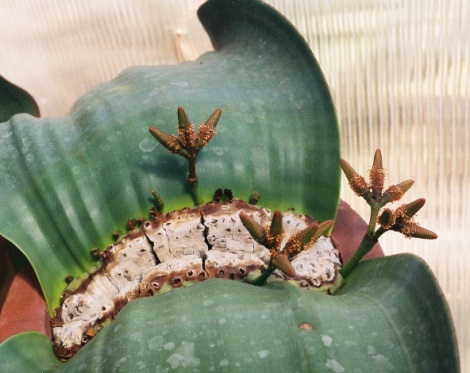 Detail of a Welwitschia mirabilis plant showing its two leaves and male cones. Darwin long pondered the origin and rapid diversification of flowering plants, describing them as an “abominable mystery”. In comparison with gymnosperms, which possess rather rudimentary male and female cones (like the pine cone), flowering plants present several innovations: the flower contains the male organs (stamens) and the female organs (pistil), surrounded by petals and sepals, while the ovules, instead of being naked, are protected within the pistil. 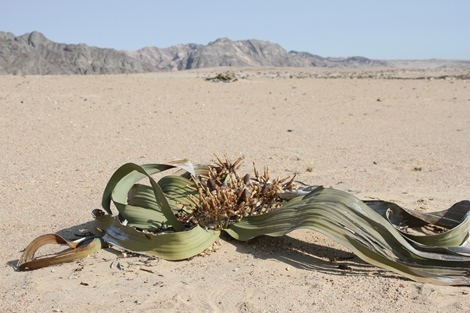 A female Welwitschia mirabilis plant in its natural environment in the desert of Namibia. How was nature able to invent the flower, a structure so different from that of cones? The team led by François Parcy, a CNRS senior researcher at the Cell and Plant Physiology Laboratory (CNRS/Inra/CEA/Université Grenoble Alpes), has just provided part of the answer. To do so, the researchers studied a rather original gymnosperm called Welwitschia mirabilis. 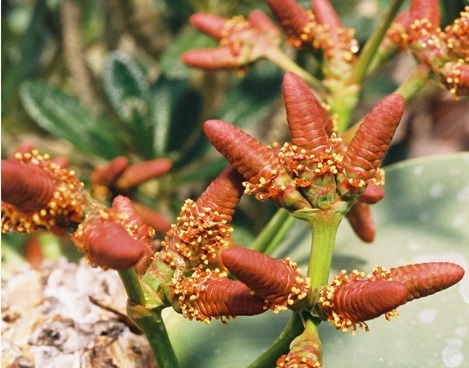 This plant, which can live for more than a millennium, grows in the extreme conditions of the deserts of Namibia and Angola, and, like other gymnosperms, possesses separate male and female cones. Close-up on male cones, on which pollen can be seen. What is exceptional is that the male cones possess a few sterile ovules and nectar, which indicates a failed attempt to invent the bisexual flower. Yet, in this plant (as well as in certain conifers), the researchers found genes similar to those responsible for the formation of flowers, and which are organized according to the same hierarchy (with the activation of one gene activating the next gene, and so on)! The fact that a similar gene cascade has been found in flowering plants and their gymnosperm cousins indicates that this is inherited from their common ancestor. This mechanism did not have to be invented at the time of the origins of the flower: it was simply inherited and reused by the plant, a process that is often at work in evolution. The study of the current biodiversity of plants thus enables us to go back in time and gradually sketch the genetic portrait of the common ancestor of a large proportion of modern-day flowers. The team is continuing to study other traits to better understand how the first flower emerged.